Listen up! Can you hear me ok? I want you to pay attention because I am going to teach you something you might not have heard about before. In case you don’t know, the words hear and listen have different meanings and uses. Many English students use hear and listen as if they were the same, but as you are about to see this can lead to confusion. I’m going to offer a simple explanation before I tell you a story, and then I will go into more detail of the differences between hear and listen. Listening is something done deliberately, such as listening to music (remember that music is a false friend from Portuguese). Hearing is something done involuntarily; you don’t get to choose the things that you hear. Keep that in mind while you read the story. “Yes, I hear lots of music. I hear Michael Jackson, the Beatles, Jimi Hendrix and Elvis Presley. Do you hear them?” I thought it was strange that he seemed to be hearing music in the quiet room and I found it even stranger that he only heard dead musicians. Was he somehow talking to the dead? “No I don’t hear them and I don’t think anybody else hears them either,” I said to José with growing nervousness. “Are you crazy? Everybody hears the Beatles. They are everywhere!” He was starting to get excited and more animated as he talked. “Yes I hear them everyday,” said the man as if it was perfectly normal to hear dead people every day. I was really starting to get nervous about spending the night at a hostel where it was normal for people to hear dead people, and I considered leaving to spend the night at another hostel. “You mean to say, ‘Do you listen to the Beatles.’ Of course, I listen to them every day.” And just like that I realized what José was trying to ask me the whole time. José didn’t know the difference between hear and listen, and I hadn’t been around foreigners long enough to know that they have difficulties with those words. Hear or Listen, What’s the difference? Hearing is something that happens with out any intentional effort. You can hear something without trying, you can even hear something if you don’t want to hear it. In contrast, listening is something that is done deliberately. If you listen to something it is because you choose to listen to it. Listening can also be synonymous with paying attention. The sentences below show the contrast that exists between listen and hear. I listened outside the window, but I couldn’t hear what they were saying inside. Note here that even if you listen, you don’t always hear what you are trying to hear. The teacher’s lesson was boring, so I stopped listening until I heard him say that class is cancelled next week. Note here that even if you aren’t listening you might hear something. In the story with José he used the word hear to talk about music when he should have used listen. We use listen with music because it is a deliberate choice to listen to it. 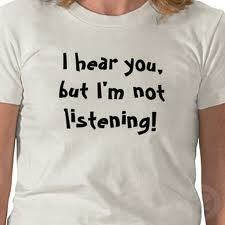 Here are some other cases where listen is not interchangeable with hear. Taken from the Cambridge Advanced Learners Dictionary. She does all the talking – I just sit and listen. You haven’t listened to a word I’ve said! We listened in silence as the names of the dead were read out. Listen, we really need to sort out our insurance claim this weekend. Listen to this! You can win a holiday for two in the south of France just by answering three simple questions. In these examples hear cannot be replaced by listen because the subject has no choice in hearing. Again from the Cambridge Advance Learners Dictionary. My grandfather is getting old and can’t hear very well. You’ll have to speak up, I can’t hear you. I heard/I could hear someone calling my name. At eight o’clock Jane heard him go out. After listening to me talk about the subject you’ve learned about the differences between listen and hear. You’ve learned that you like listening to music but you don’t like hearing it when you’re trying to sleep. Make sure you incorporate listening activities into your daily life as much as you can so that you increase your listening comprehension. Talking with native speakers of English is a good way to increase your listening abilities. This Saturday we will be having another Real Life English event here in Belo Horizonte. To receive information about this event and future events make sure you subscribe to Real Life English today in the form below. If you liked this post please share it with your friends on Facebook by clicking the like button on the side of the page. What problems have you had with words that have similar meanings in English? It was amazing, I would like to improve my English skills.